Painful and often persistent, sciatica is characterized as low back pain that radiates down the back of the leg, sometimes into the calf, then into the foot. As sciatica is caused by nerve compression, it’s important to determine what’s compressing the nerve, disc or muscle. We understand how discouraging it can be to try to go about your everyday tasks when you’re in pain. Fortunately, we can alleviate your sciatica. For disc-related sciatica, we use painless methods like Cox-Flexion Distraction and laser therapy to help increase healing speed. We also use Kinesio Taping® to help decrease pain between treatments. When there’s muscle compression on the nerve, we would use more manual therapy such as massage, specifically the Trigger Point Technique. Then we add stretching and laser therapy. Personalized stretching programs and exercise routines round out our treatment approaches. Palm Beach Gardens chiropractor Dr. James Cima has helped many patients experience relief from sciatica. One such patient who was in his late 30s was told he needed to have surgery. Seeking a noninvasive alternative, he decided to obtain treatment from us for two weeks to see if we could help him. We used manual therapy along with some decompression and laser therapy. As a result, he was able to start walking normally again with no sciatica. You don’t have to put up with sciatic nerve pain. 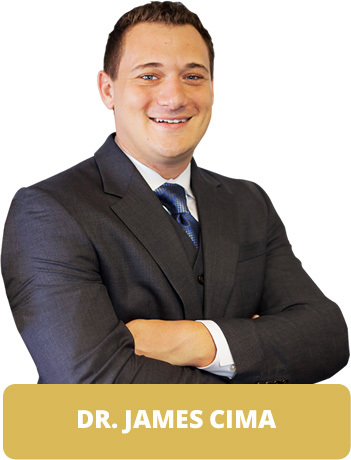 Contact us to book your consultation with Dr. James Cima today!